Earn Free Gift Cards Archives - Who Said Nothing in Life is Free? 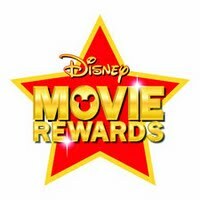 If you have enough Disney Movie Reward points, you can get a FREE $10 Disney gift card (works at The Disney Store and Disney parks). I had just enough and grabbed it while it was available ! Starting March 2nd, you will be able to redeem 2,200 Swag Bucks for one $25 Gift Card OF YOUR CHOICE once a month (excludes PayPal and Gas Cards). Plus they will start offering a $3 Amazon Gift Card for only 300 SB. Unfortunately, they will no longer offer the $5 Amazon Gift Cards for 450 SB. 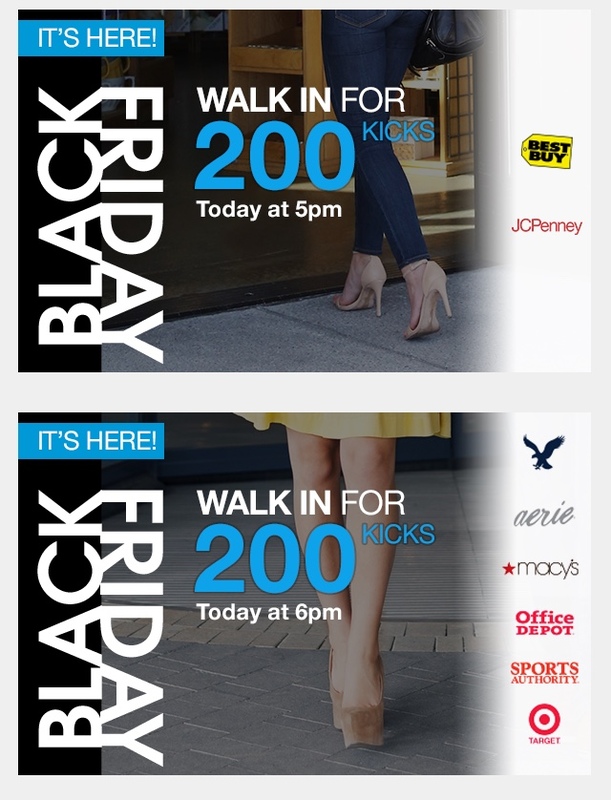 Today on the SHOPKICK APP you can get 150 kicks when you walk into a Best Buy, Aerie, American Eagle, Macy’s, Sports Authority and JC Penney. Along with all the other gift cards you can get on MyCokeRewards (like Walmart, McDonalds, Best Buy, TJ Maxx) you can get a $25 The Home Depot gift card for 620 points! They also have a $10 Nike gift card for 250 My Coke Rewards points. I just wanted to remind you about the Shopkick app. They are offering 200 kicks for walkins at a ton of locations plus I see over 900 kicks from scans at Walmart. 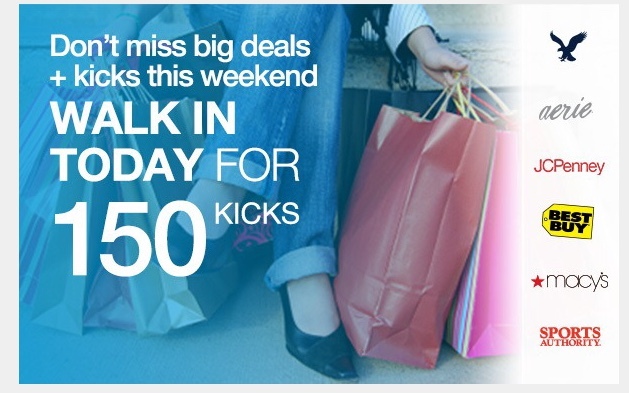 Carters has 200 kicks from scans and Best Buy has 300 as well. Even PetSmart has 525 and Verizon has 900. This is a great way to get extra gift cards for yourself when giving gift cards as gifts this holiday season !!! Applebee’s: receive a $10 bonus card when you buy $50 gift cards. Bonus card expires 2/28/15. Bahama Breeze: Spend $500 of more on a party in Nov or Dec and every guest will receive a $10 gift card. BJ’s Restaurants: receive a $10 bonus card when you buy $50 gift cards thru 12/25/14. Bonus card valid 12/26/14 – 2/28/15. Bonefish Grill: receive $20 bonus gift card when you buy $100 in gift cards. Bonus card redeemable 1/1-2/11/15. Bravo: receive $20 in bonus gift card with every $100 in gift cards. Bonus card redeemable 1/1-3/15/15. Brio: receive $20 in bonus gift card with every $100 in gift cards. Bonus card redeemable 1/1-3/15/15. California Pizza Kitchen: receive a $20 rewards card when you buy $100 worth of gift cards. Bonus card valid 1/12-3/1/15. Carrabba’s: receive $20 in bonus gift card when you buy $100 in gift cards. Bonus card redeemable 1/1-2/10/15. Champps: receive a $10 Extra Points Card with every $50 gift card purchase. Chili’s: receive a $10 eBonus card with $50 gift card purchase. First Watch: receive $20 Bonus Bucks when you buy $100 in gift cards. Bonus Bucks valid 1/1-2/28/15. Flat Top Grill: receive $5 Bonus Card for every $25 you buy in gift cards. 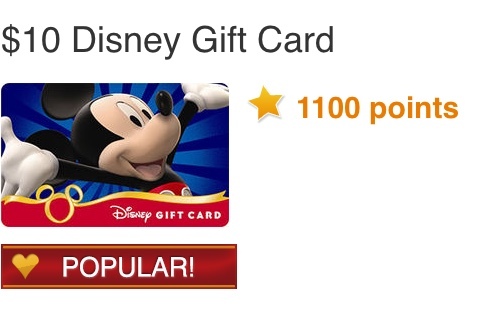 For every $100 you buy in gift cards, get $25 Bonus Cards. Joe’s Crab Shack: receive $30 in coupons when you buy $25 in gift cards. Lone Star Steakhouse: receive a $5 coupon when you buy $25 in gift cards, receive a FREE starter when you buy $50 in gift cards, receive a FREE entree (up to $20) when you buy $100 in gift cards. Coupons redeemable 1/1-1/31/15. Maggianos: receive a $20 promotional Bonus Card for every $100 in gift cards. Plus receive a subscription to Food and Wine Magazine (or ask for refund!) Promotional Gift Card valid on $50+ purchase from 1/2- 2/28/15. Max & Erma’s: receive a $5 bonus card for every $25 you buy in gift cards. Bonus cards are valid 1/1/ – 3/31/15. Montgomery Inn: receive a $20 bonus gift card when you buy $100 in gift cards. Bonus card valid 1/2-3/31/15. Outback Steakhouse: receive $20 bonus gift card when you buy $100 in gift cards. (you can even make personalized gift cards, including pictures). Bonus card redeemable 1/1-2/11/15. Pei Wei: receive a $10 bonus card when you purchase $50 in gift cards thru 12/24. Bonus card is valid 11/11-1/4/15. Red Lobster: Receive $5 off bonus coupon when you buy $25 in gift cards. Bonus coupon is valid 1/1/14 – 2/1/15. Roy’s: receive $20 bonus gift card when you buy $100 in gift cards. Bonus card redeemable 1/1-2/11/15. Ruby Tuesday: receive $5 bonus coupon when you buy $25 and $15 bonus coupon when you buy $50 in Ruby Tuesday Gift Cards (plus free Shipping!). Free bonus coupons delivered via email and are valid from 1/2/15-2/28/15. Ruth’s Chris: receive 10% Bonus Card when you buy $250 or more in gift cards. Holiday bonus cards valid 1/1/14 through 3/31/15. Smashburger: receive $5 Smash Cash when you buy $25 in gift cards. Smash Cash valid 1/1-1/31/15. Steak ‘n Shake: receive a $5 Bonus certificate when you buy $20 in gift cards. Certificate valid 1/5-2/28/15. Tony Roma’s: receive $15 in RomaBucks For every $50 in Tony Roma’s Gift Cards you purchase. RomaBucks are valid 1/2 – 3/24/15. DSW: receive a $5 bonus gift card and free box when you buy $50 in gift cards thru 12/26/14. Bonus card is valid between 1/9-1/24/15. Half Price Books: receive a $5 bonus gift card when you buy $25 in gift cards. Gift cards must be purchased by 12/24/14, bonus gift card valid 1/1-1/31/15. 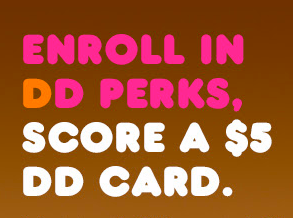 New DD Perks Rewards members will get a FREE $5 bonus DD Card when you register via the Dunkin Mobile App! Just add or purchase a DD Card to your account and use the code BONUS during enrollment. Even sweeter, you will also score a free medium beverage of your choice just for signing up (cooler beverages are excluded). For more information head over to the Dunkin Donuts Facebook page.